Consider learning Italian at your own pace and with flexible learning time with Parola school. Whether you want to learn Italian grammar or learn how to converse and enhance your fluency, Parola can give you the opportunity to improve your Italian through its quality private lessons. An individual Italian language course in Florence is the best way to learn both written and oral Italian quickly and intensively at an affordable price, and with flexible training time. At Parola, our private Italian lessons in Florence are tailored to each student’s specific needs; many students choose to take private Italian lessons for both business purposes and personal interests. 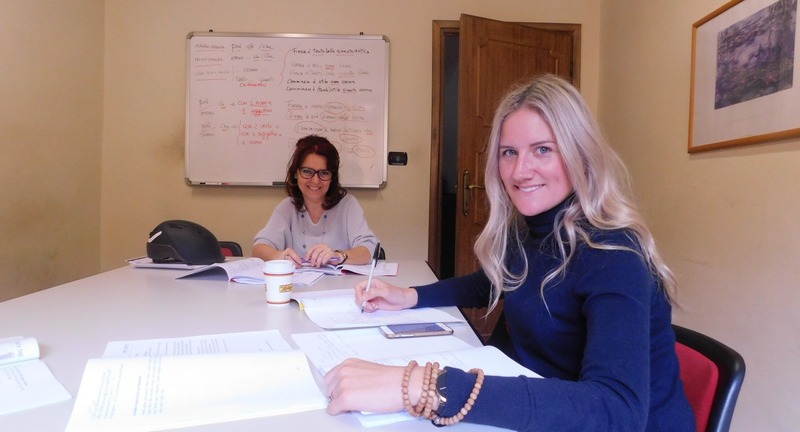 Students who have taken a one-on-one Italian language course at Parola have expressed that this personalized instruction has significantly improved their Italian language knowledge. Our private Italian language lessons are an excellent option for learning Italian grammar and improving language fluency and pronunciation in a short amount of time. For many students, private tutoring is essential to aid comprehension, learn the grammar rules, and increase spoken fluency. Besides that, these lessons are especially beneficial to students who do not already speak a language derived from Latin. Please contact Parola Italian language school to let us know your specific language goals or requirements (i.e. improving your grammar or Italian conversation, etc.). We will then select a teacher who would best meet your language needs and formulate a personalized schedule for your private Italian language course. One-on-one lessons can include various topics, such as business vocabulary, speaking fluency, or the fundamental rules of Italian grammar. All of the prices for the individual Italian language courses listed below are based on a weekly basis. Contact Parola Italian language school to receive further information about prices, discounts and arrangements for private Italian language courses in Florence. Students enrolled in individual Italian language courses at Parola have the advantage of choosing a single instructor or multiple private Italian teachers, each of whom follows the student’s progress individually. Parola’s Italian language instructors focus on Italian grammar, pronunciation, and fluency in order to provide an all-encompassing Italian language program tailored to the specific needs of the individual student. In particular, business people find one-on-one Italian classes useful and effective, as they benefit from the personalization of the Italian vocabulary and pronunciation used in their individual lessons. Students generally feel at ease since they practice their grammar and pronunciation privately with their instructors, which leads to excellent learning results in a short amount of time. Parola Italian language school also runs an individual Italian language program in Montecatini Terme, where private Italian lessons are held in a hotel lounge or at the student’s home. Montecatini Terme is a quaint and relaxing town, with specifically tailored Italian language courses for adults. However, language courses in Montecatini are available for students of all ages. Please note that the Italian courses in Montecatini are only one-on-one lessons, privately taught by one of Parola’s certified instructors. For further information about our individual Italian language lessons, please contact our Italian school in Florence; we will be certain to reply promptly.